I'm pretty much finished with Azrael now. There are a few things I still need to do like add the studs to his collar and adding the purity seal in their correct places. I went in and added the rest of his glove along with some studs around the edge to match his other hand. My Client asked that he mounted on a cityscape type base and I gave him a choice of four resin bases to pick from to add a little more detail to the model. The bases are from Dark Art Miniatures. He went with option D and with a little cleaning and a pin, the model was set. I needed to make sure I had him attached well enough to support the metal backpack and banner. 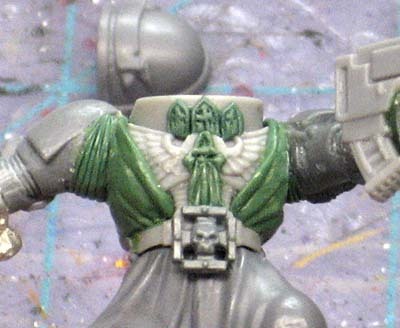 I even had to pin his backpack to his torso too. With the arms built, I glued them in position and greenstuffed the void spaces around the shoulders to make it look like flex fitting. Other than the collar studs, my Client is debating on whether or not to have the rebreather element added or to just leave it off. You can throw in your two cents below and let him know what you think. That is all manner of intensely cool. As for a rebreather, I would totally go for it! But then it's not my model, so not my say. 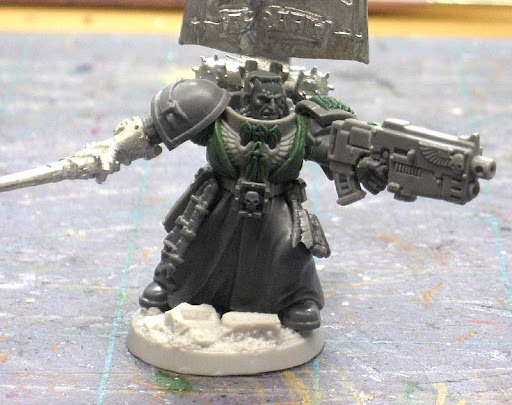 Wow Ron that is actually a pretty cool take on the DA chapter master. 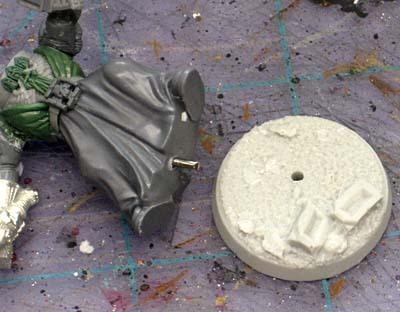 As per the rebreather I agree with akhrin and say go for it as it would make the model just really stand out. It could be the difference between a good conversion and a great conversion. That conversion is very nice. Pose is very dynamic. Very nice work! 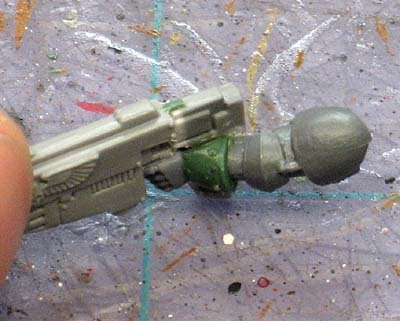 The combi-weapon looks fantastic, and I'm (as usual) jealous of your sculpting talents on the little fiddly details. Top notch all around! That is a great conversion, Ron. You've really hit your stride on these. I'm really enjoy following these progress threads. 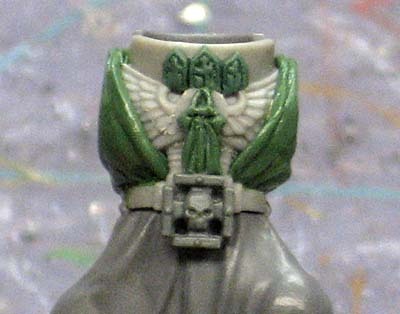 I went in and added some greenstuff studs to his collar and now I'm going to attempt to create the belt he has on made of the small terminator honors symbols. The bullpup config on the combi-plas is sweet!